Immigration lawyer Margaret Stock displays a document sent to U.S. Army enlistee Shu Luo, threatening him with deportation. The Army has long had shortages of health care workers and speakers of certain languages, and in 2009 it started doing what other industries, including the medical field have done: It looked to skilled immigrants. A program, called Military Accessions Vital to the National Interest or MAVNI, recruited thousands of foreigners already in this country who were seeking citizenship. But hundreds who signed up have been exposed to the risk of deportation — including Shu Luo, a Chinese recruit who was arrested in New Jersey last week. Margaret Stock, a retired lieutenant colonel who helped create the MAVNI program for the army, says the military badly needs people like Luo, who has a masters degree in statistics from George Washington University. "We need people who are fluent in Chinese and English, who have graduated from top universities in the United States, and who are loyal to the United States of America," says Stock, who became an immigration lawyer after leaving the military, and is representing Luo. "He loves America. He wanted to serve in America," she said. "And he was very excited about being in the Army and using his tech skills to help the Army." In 2016 the Defense Department put in place new, stricter background checks on immigrants, but the increased vetting has been taking so long that hundreds of recruits who had enlisted but not yet shipped out to boot camp — including Luo — were going to run out of time on their visas. Defense Secretary Jim Mattis said earlier this year that he had been assured by the Department of Homeland Security that it would not deport MAVNI recruits, and hundreds were given an extension of their status. But according to sworn statements by Luo's recruiting officers, he was left out of that extension by mistake. Luo was arrested and released last week, the Department of Homeland Security told NPR, and was told by the Army to apply to a correction board — which usually takes months if not years. But after NPR and Stars and Stripes reported on his story, his case seemed to be resolved. The Pentagon says his enlistment status has been corrected, and ICE has confirmed it will not proceed with deportation. Stock says that, if Luo had been deported back to China, he would have been in danger. "He signed an oath to the United States, the standard enlistment oath, and that's an expression of a pro-American political opinion for which he would be persecuted," she said. "I'm sure he would be arrested, probably, at the very least." Luo told NPR he's very happy he can stay in the U.S. where he feels a sense of freedom. Stock says Luo is keen to finally go to basic training — and that several other MAVNI recruits also were told recently that their cases have been corrected. Now an update on a story from earlier this week. A graduate student from China joined the U.S. Army under a special program designed to recruit people with language and professional skills. The military has long been a fast track to citizenship. 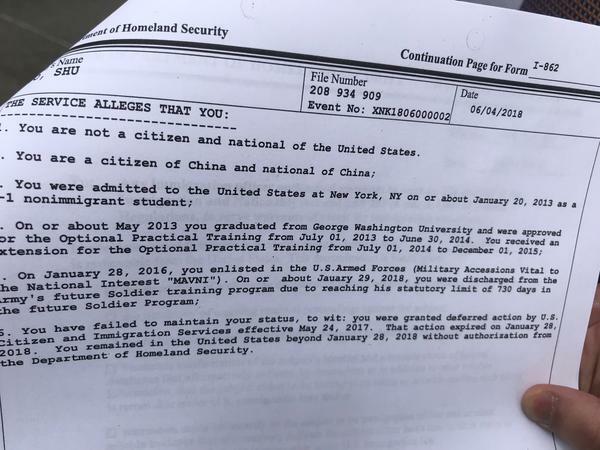 But in this particular case, an apparent clerical error put this man on a list for deportation back to China before he could even start basic training. After our story, it appears that the Pentagon has corrected the error. And NPR's Quil Lawrence reports the deportation case has been dropped. QUIL LAWRENCE, BYLINE: The Army recognizes that it's short on health care professionals and speakers of certain languages. And in 2009, it started doing what others, like the medical field, have done. It looked to skilled immigrants. A program called Military Accessions Vital to the National Interest, or MAVNI, recruited thousands of foreigners in this country seeking citizenship, like a Chinese student named Shu Luo with a master's in statistics from George Washington University. MARGARET STOCK: The Army needs people like him very badly. We need people who are fluent in Chinese and English, who have graduated from top universities in the United States and who are loyal to the United States of America. LAWRENCE: That's Margaret Stock, a retired lieutenant colonel who helped create the MAVNI program. Nowadays, she's an immigration lawyer. In fact, she's Shu Luo's immigration lawyer because after he signed an enlistment oath, the military added stricter background checks. Those would've taken so long to clear that Luo's visa was going to run out before he could go to basic training. Hundreds of MAVNI recruits were in the same boat. The Pentagon got a deferment for them. But Luo and some others were left out, apparently by mistake. This month, Luo was arrested and told he would be deported back to China. That would be dangerous, says his lawyer Margaret Stock. STOCK: He was very concerned about his safety if he went back to China. LAWRENCE: Luo has a pending asylum request. The Chinese government doesn't look kindly on nationals who swear allegiance to the U.S. Army. The Army said he should apply to a correction board which usually takes months, if not years. Immigration officials said they would move forward with deportation. Luo's case was reported in Stars and Stripes and on NPR. Now the Pentagon says his enlistment status has been corrected. And ICE has confirmed it will not proceed with deportation. Luo told NPR he's very happy he can stay in the U.S., where he feels a sense of freedom. He didn't want to speak for broadcast, but his lawyer says he's keen to finally go to basic training. STOCK: He was very excited, very happy, very relieved not to be threatened with deportation at the moment. He's also excited to be back in the Army. He really wanted to serve and tried really hard to stay in the military. So he's quite relieved at this point. LAWRENCE: Stock says several other MAVNI recruits were told around the same time that their cases have been corrected. None of them had yet been served with deportation proceedings. (SOUNDBITE OF BLUE STATES' "HAM BHAM") Transcript provided by NPR, Copyright NPR.